Having showcased regional and international scenes from Cambridge to Tokyo via Budapest, Hospital’s “Future Sound series takes on a whole new dimension, for the first time we take on the giant superpower that is Russia. Drum+bass has been thriving in mother Russia for a while now, with UK and international DJs bringing back reports of some mindblowing parties and clubnights. With music flooding into the Hospital office from St Petersburg, Moscow and even further afield a “Future Sound of” sstarted becoming an exciting inevitability. 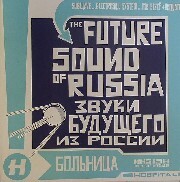 “The Future Sound of Russia” is as diverse as you’d efrom the largest country in the world. The stylistic spectrum is broad - from the soulful sounds of Electrosoul System (featuring the voice behind Freak Power Ashley Slater no less), to the experimental ambience of Bop and Dissident, via the awesome dancefloor minimalism of Subwave - these producers are some of the most talked about in the scene. his unique project has already had DJ support from right across the board Goldie, DJ Marky, London Elektricity, Blu Mar Ten and many many more have been battering these tracks on CDR and dubplate. Subwave - "I Need You"
Subwave - "Stars Get Down"
Mr Sizef & Unquote - "Hours Have No Reverse Motion"